NTU Visual Arts Society News Blog: Placeholder for AFTER SCHOOL MIDNIGHTERS Special Screening! Placeholder for AFTER SCHOOL MIDNIGHTERS Special Screening! So today, we got invited to a special preview of the new animated movie by director Hitoshi Takekiyo. There is a lot I want to say, but it's getting late, so I just put the actual post up tomorrow. 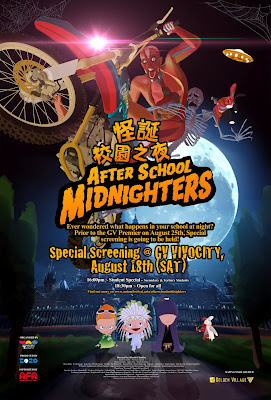 Stay tuned for a review of AFTER SCHOOL MIDNIGHTERS!